You can now search for a Rotary club with RI's free mobile app. In the Apple app store, Google Play, and BlackBerry App World, it's called the Rotary Club Locator from Rotary International. The Rotary Club Locator app helps you find a Rotary club meeting when you're on the go. A keyword search for clubs. This search looks for the keyword in either the club name or meeting location address. This is useful for finding clubs that are outside of the 100-mile radius from your current location. To view club officer contact information, you must login into the app with your RI Member Access login information. 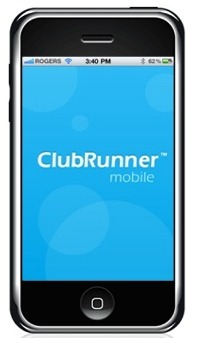 ClubRunner Mobile App Now Available! The ClubRunner Mobile App is your key to connect to your ClubRunner website on the go! Completely, free to download and use, this app will let you do what you need to run your club effectively while you're on the go. Password protected just like your website, the ClubRunner Mobile app is comprised of 3 main modules.You now will have the ability to view your member directory, view the articles posted to your website and locate the nearest club right from your iPhone or iPod, bringing you even closer to being able to connect, collaborate and communicate! To download the app from the Apple App Store, simply type in 'ClubRunner' in the search bar. Our mobile app is compatible with all versions of the iPhone, iPad and iPod Touch sets that have iOS 3.1 or later. Immediately view the most up to date member directory, upon login. You can browse your member profiles which give you the necessary contact information you need to connect with just one click. Make a call to any of their phone numbers, email them directly from your iPhone, or even add them to your iPhone/iPod contacts. Based on your current geographic location, ClubRunner’s Club Locator will instantly show you a map to visually locate the closest clubs near you. Click on a drop pin to expand and view more information on the club, including their meeting day and time and address. Perfect for doing makeups anywhere in the world! Currently only available for the iPhone, iPod and iPad sets, we will also be releasing the ClubRunner Mobile App for Android phones in the near future. Please note that the Stories and Members features are only available to clubs that are direct subscribers of ClubRunner. The Club Locator is available to all.